Customize the appearance of TouchScreen by uploading up to 100 of photos for the screen savers and even selecting one to use as the background wallpaper. Importing photos into TouchScreen is simple using the TouchScreen Desktop App software and an SD memory card. Compatible with any Mac or PC desktop or laptop computer, TouchScreen Desktop App is included with the TouchScreen thermostat and can be downloaded by clicking the link below. TouchScreen also comes with more than a dozen built-in nature and holiday-themed photos that can be used as background wallpaper for the thermostat. Holiday themes include Christmas, Hanukkah, Thanksgiving, Halloween and Cinco de Mayo. Each theme has separate photos, displaying daytime and nighttime shots, along with showing the sun for day and the moon for night. “Simple as You Want” operation allows the cooling references to be removed from the display for homes without air conditioning and allows TouchScreen to be installed as a programmable or non-programmable thermostat. “Simple Stat” operation mode provides enlarged display numbers and fewer display items, making it perfect for the most basic users. Intuitive “Time Period” Scheduler automatically changes the temperature and mode for up to four periods per day, allowing for comfortable temperatures for sleeping, waking, and daytime, plus an energy savings mode for when no one is home. “At-a-Glance” screen – clearly shows the heating and cooling status, as well as the room temperature (the temperature number in blue if air conditioning is on; in red if heating is on). Optional Outdoor Temperature Sensor allows the outside temperature to be displayed right on the screen along with the option to display the high and low temperatures for the day. Nighttime dimmer for bedroom thermostats allows adjustment of the time when the dimmer is on. The active and idle brightness levels can also be adjusted, from 0 to 100 percent brightness with complete darkness being an option when the dimmer is idle. Energy Usage Information shows how much energy has been used to heat and cool for the past seven days helping in the evaluation of energy conservation options and opportunity to decrease energy costs. Automatic screen lock available that can lock the screen minutes after it has been touched and requires a pass code to enable access (eliminates kids or guests changing thermostat settings). Security settings also enforce temperature set point limits – the system runs within set temperature parameters so that no one can run the air conditioning too low or the heat too high. Program alerts for Service Filter and UV Light reminders along with a customizable Service Call display the contractors logo and contact information. TouchScreen is compatible with most heating and air conditioning equipment and controls gas/electric or heat pump equipment, with up to 4 heating and 2 cooling stages and is dual-fuel capable. Easily find and upload photos. Editing tools allow for photo placement, color and brightness adjustments. Allows the contractor to provide service contact information. See an “overview” of the time period schedule for heating and cooling and edit the schedule from any Mac or PC desktop or laptop computer running TouchScreen Desktop App. Adjust preferences, alerts, daylight savings, vacation, security, and overall system settings. 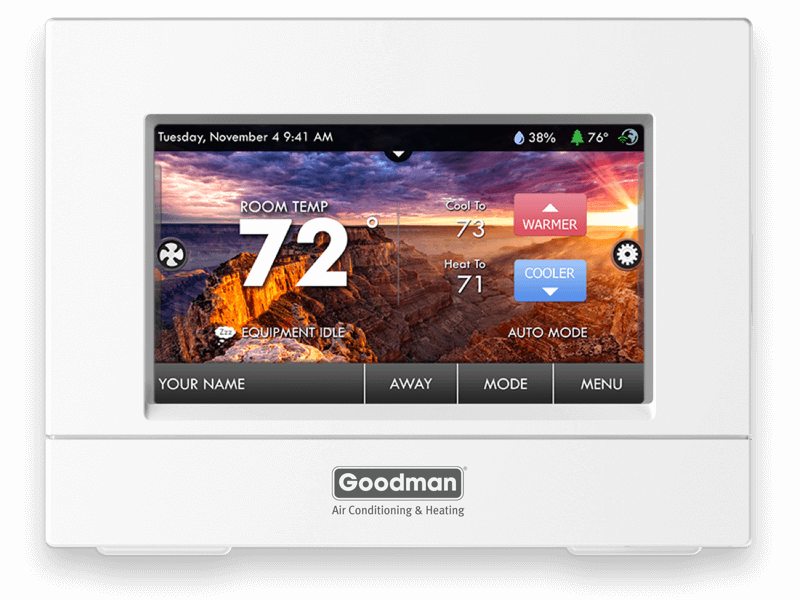 The TouchScreen Desktop App application automatically connects to the Goodman Thermostats web site and updates the TouchScreen Desktop App and thermostat firmware to the latest revisions at no charge. TouchScreen Desktop App then updates the firmware to the SD memory card to be uploaded to the thermostat. Updating the firmware ensures that the most current system software, including new features and performance enhancements, are available.